From an early age, I developed a taste for wanting to experience as many different games as possible. Reading gaming magazines like EGM and Gamepro opened my eyes to the world of gaming at large, supplying me with a seemingly never-ending list of great games to play. Even as a kid with nothing more than my allowance meant to be spent on lunch at school, I’d settle for a bag of chips as my lunchtime meal every day and pocketed the rest to buy as many games as I could. Beyond the joy that comes from directly playing a game, I like the way in which that experience enriches other aspects of my life. Even before content creation became a hobby of mine, having first-hand knowledge of a game made it easier for me to be invested in gaming news and the broader gaming conversation. One of the side effects that comes from chasing the next shiny thing is that I generally don’t bother with content that isn’t mandatory. Most of the time, whatever is presented as the main experience is usually enough for me to enjoy. Besides a strong desire to use that time to play new games, I oftentimes find that side missions or secondary objectives in games are largely there to pad out an experience more than improve it. Of course, there are exceptions, but I generally stick to the main path. 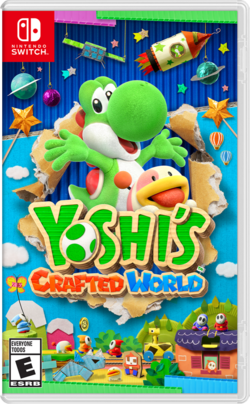 Had I seen my brother right as I agreed to lending him Yoshi’s Crafted World, I probably would have let it go without hesitation. However, we probably won’t reunite for another few days and I’m at a bit of a new game standstill until heavy hitters like Mortal Kombat 11, SteamWorld Quest, and Cuphead drop later this month. With time to spare, I’ve been playing more of Yoshi’s Crafted World than I would have expected. It’s moments like this where I actually appreciate the process of working through more of what a game has to offer. At first, I thought the idea of playing the game’s flip side levels was a hokey way of extending the game’s life. While you’re not getting a whole other campaign out of it, there are numerous visual and gameplay differences that come with the change of perspective that does freshen up the experience in a meaningful way. Furthermore, flip side levels reward speedy players with a flower that can be used to unlock new areas while also cleverly preventing players from burning out on levels played in reverse. On top of that, the final round of levels in Yoshi’s Crafted World are excellent. They really up the challenge and creativity as a reward for players who put in the effort to grab as many flowers as they could along the way. The concept isn’t new, as a number of Super Mario games have done something similar, but it’s a welcome addition here as well. I don’t think Yoshi’s Crafted World is going to change my “Thank U, Next” approach to consuming games. Will still value the experience of playing something new and adding more knowledge to my mental database over squeezing every last ounce of value out of the games I already have. However, taking a deeper dive into this one has proven to be a worthwhile experience in ways that I wasn’t expecting. I usually don’t go for 100% either, with games from franchises such as Mario, Zelda, and Metroid being the exception, but Crafted World is so light and fun that I decided to completely clear it. I am glad I did, because the flip side levels are fun. My problem is related to the souvenirs, which are a bit of a chore to track down, but I am almost done finding all of them.